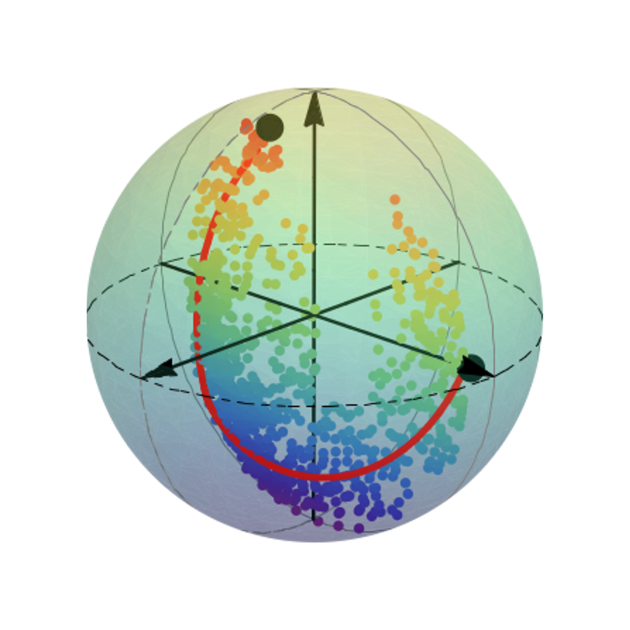 In a new paper featured this week on the cover of Nature, scientists from the University of Rochester, University of California at Berkeley and Washington University in St. Louis have shown that it is possible to track these quantum trajectories and compare them to a recently developed theory for predicting the most likely path a system will take between two states. Andrew N. Jordan, professor of physics at the University of Rochester and one of the authors of the paper, and his group had developed this new theory in an earlier paper. The results published this week show good agreement between theory and experiment. Kater Murch, co-author and assistant professor at Washington University in St. Louis, explained that a key part of the experiment was being able to measure each of these trajectories while the system was changing, something that had not been possible until now. Jordan compares the experiment to watching butterflies make their way one by one from a cage to nearby trees. “Each butterfly’s path is like a single run of the experiment,” said Jordan. “They are all starting from the same cage, the initial state, and ending in one of the trees, each being a different end state.” By watching the quantum equivalent of a million butterflies make the journey from cage to tree, the researchers were in effect able to predict the most likely path a butterfly took by observing which tree it landed on (known as post-selection in quantum physics measurements), despite the presence of a wind, or any disturbance that affects how it flies (which is similar to the effect measuring has on the system). “The experiment demonstrates that for any choice of final quantum state, the most likely or ‘optimal path’ connecting them in a given time can be found and predicted,” said Jordan. “This verifies the theory and opens the way for active quantum control techniques.” He explained that only if you know the most likely path is it possible to set up the system to be in the desired state at a specific time. The experiment was discussed in a Nature “News and Views” article published in this week’s issue. For more information on a related experiment, read Andrew Jordan’s commentary published in an earlier issue of Nature.